Senior Games is a holistic approach to keeping the body, mind, and spirit fit while enjoying the company of friends, family, spectators and volunteers. Senior Games is a year-round health promotion program for persons age 55 and better. Each spring Region K Senior Games hosts the local athletic and SilverArts competition. 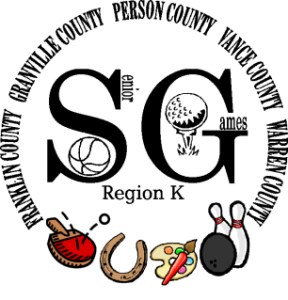 Residents of Franklin, Granville, Person, Vance, and Warren counties are eligible and encouraged to compete in Region K Senior Games. SilverArts embraces a philosophy which strives to keep seniors healthy, active and involved. It provides a stage to display the creative talents of the Visual, Heritage, Literary and Performing Arts. Encouragement and recognition of creative potential and accomplishment is the goal. Contact the coordinating agency in the county where you reside (listed below,) call Local Coordinator Melissa Catlett at 252-436-2040, or email at mcatlett@kerrtarcog.org . Region K Senior Games… Come Play With Us!! !